This is the useful working Power (also called Actual Power or Real Power). It is the power that actually powers the equipment and performs useful work. This power is measured in KW. It is the power that magnetic equipment (transformer, motor and relay) needs to produce the magnetizing flux. In summary, Reactive power is required to set up the magnetic field while the Active power produces the useful work (shaft horsepower in the case of electric motors). Total Power is the vector sum of the two and typically represents what we pay for in electricity bills. Having understood the basic concepts above, we now define power factor. The higher the ratio of KW to KVA, the larger the power factor. Power factor has a maximum value of 1. In order to have an efficient system, we want power factor to be as close to 1.0 as possible. In practice however, our electrical distribution sometimes has a power factor much less than 1.0. What then causes low power factor in the electrical distribution system? These inductive loads constitute a major portion of the power consumed in industrial complexes. 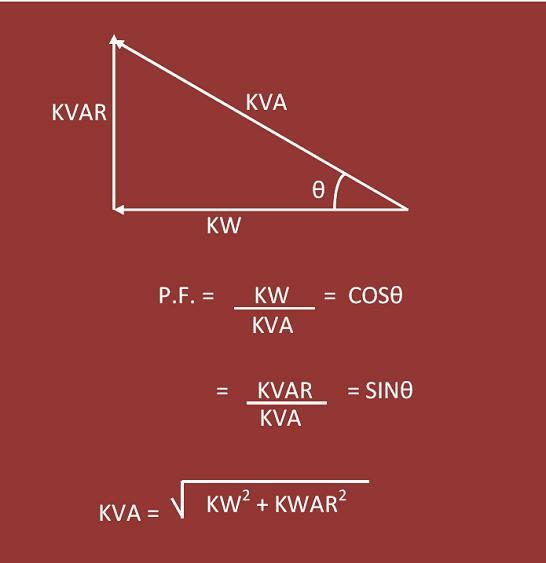 Reactive power (KVAR) required by inductive loads increases the amount of apparent power (KVA) in the electrical distribution system. This increase in reactive and apparent power results in a low power factor.